Marquez (2-1) struck out nine and walked none while throwing 105 pitches in the first complete game in the majors this season. 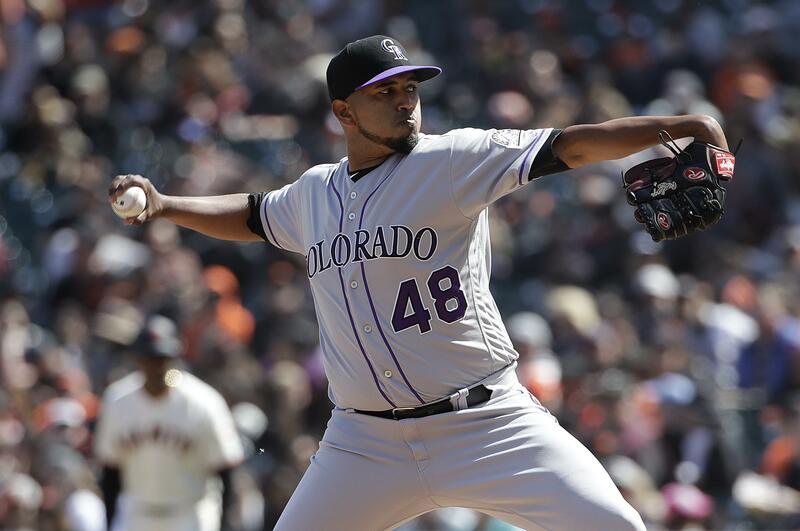 It was the first complete game for Marquez in 156 pro starts, including 69 in the big leagues. Red Sox 4, Orioles 0: In Boston, David Price pitched seven stellar innings with seven strikeouts, Xander Bogaerts hit a three-run homer and drove in every run, and Boston beat Baltimore. John Means (1-2) gave up a run and four hits in five innings, striking out three and walking one in just his second big league start. Phillies 3, Marlins 1 (14): In Miami, Jean Segura’s two-run homer to left in the 14th inning put Philadelphia on top, and the Phillies beat Miami in the longest game of the young season for either team. Wei-Yin Chen (0-1) came on to pitch the 14th, was charged with both runs and his ERA actually dipped from 24.75 to 23.40. Chen – the highest-paid Marlins player this season, making $20 million – has allowed 12 runs over three innings of relief in his last two appearances. Dodgers 7, Brewers 1: In Los Angeles, Ross Stripling tossed eight strong innings to rescue an overworked bullpen, Joc Pederson and Alex Verdugo homered, and Los Angeles routed Milwaukee to snap a six-game skid. White Sox 5, Yankees 2: In New York, Tim Anderson hit his first career grand slam and Carlos Rodon pitched Chicago over scuffling New York. Jose Abreu nearly had a grand slam as well – to almost the same spot in the ballpark – but settled for a sacrifice fly when right fielder Aaron Judge made a jumping catch in front of the wall. Held to one hit Saturday in a 4-0 loss, Chicago chased Masahiro Tanaka (1-1) with nobody out in the fifth and won for only the second time in eight games. Yoan Moncada had three hits and a walk for the White Sox (5-9), who stole five bases in the last five innings – several of them uncontested. Chicago won two of three to take consecutive series in the Bronx for the first time since 2002-03. Before last August, the White Sox hadn’t captured a series at Yankee Stadium since 2005. Royals 9, Indians 8: In Kansas City, Missouri, pinch-runner extraordinaire Terrance Gore stole a base and then scored on Hunter Dozier’s single in the ninth inning, lifting Kansas City over Cleveland to complete a three-game sweep of the AL Central favorites. The Royals roughed up two-time Cy Young Award winner Corey Kluber, who allowed 11 of his 18 batters to reach base safely. He gave up six runs, six hits and a career-high five walks in just 2 2/3 innings. The five walks doubled Kluber’s season total – he didn’t walk more than three batters in any game in 2018. Astros 3, Mariners 2: In Seattle, Gerrit Cole struck out 11 in six innings, Aledmys Diaz homered and Houston completed a three-game sweep of Seattle. Cardinals 9, Reds 5; In Monterrey, Mexico, Marcell Ozuna hit two home runs and Matt Carpenter connected for a tiebreaking drive in the seventh inning that sent St. Louis over Cincinnati for a split of their two-game series in Mexico. Rays 8, Blue Jays 4: In Toronto, pinch-hitter Guillermo Heredia homered to cap a five-run burst in the eighth inning and Tampa Bay beat Toronto for its fifth straight series victory to start the season. Pirates 4, Nationals 3: In Washington, rookie Jason Martin hit a tiebreaking double in the top of the ninth inning against Washington’s shaky bullpen, then Felipe Vazquez escaped a bases-loaded jam to give Pittsburgh a win. Twins 6, Tigers 4: In Minneapolis, Jose Berrios (2-1) pitched into the seventh inning for his first win since opening day, Trevor Hildenberger struck out two with the bases loaded for his first save and Minnesota beat Detroit to complete a two-game sweep. Rangers 8, Athletics 7: In Arlington, Texas, Danny Santana had a two-run, pinch-hit triple and scored the go-ahead run on Delino DeShields’ bunt single during a four-run eighth inning, lifting Texas over Oakland. Diamondbacks 8, Padres 4: In Phoenix, Zack Greinke pitched seven strong innings and helped himself with two hits, pinch-hitter David Peralta connected for a three-run homer and Arizona beat San Diego to stop a four-game losing streak. Braves 7, Mets 3: In Atlanta, Julio Teheran outpitched Jacob deGrom, Josh Donaldson and Nick Markakis homered, and Atlanta beat New York. Published: April 14, 2019, 8:43 p.m.